Judy Garland sang this Cole Porter song in the 1940s. The Haders must have heard it—they were great radio listeners. I wonder if they realized how it was an apt description of their lives. When my next door neighbor, Jeff Chapman, heard the book I was working on was about artists Berta and Elmer Hader, he came up with the perfect title Drawn Together. My editor at Concordia added the subtitle, because art was just one of the talents they had. Their love and curiosity for life, and their ability to attract and keep friends were equally important. Researching the Haders was a delight, and I wish I could have met them. Part of their charm was the number of friends they made early on, who stayed friends for life, even after becoming well known. Many of them, such as editors and publishers, started out as a business arrangement and turned into close friends. Others were originally just friends of friends. Berta and Elmer took great interest in everyone’s achievements. Elmer grew up in a family of five children, went to school in San Francisco, and fought the fires after the earthquake. He was accepted into the California School of Design when it reopened and sailed through, getting scholarship after scholarship. He became a member of the Bohemian Club for young artists and writers. After graduating with a full tuition scholarship to France, he joined forces with another student. The two of them used their experience of being art models for their classmates to create a successful vaudeville act, traveling the circuit across the United States. He coped with a variety of people and customs. Berta was a “caring child” according to her widowed mother, who traveled to find social worker jobs to support her two children. She was often the “new girl” in town, adaptingto new areas, schools, and people. As an adult, moving to San Francisco to take over a friend’s fashion illustrating business, she became close friends with the Bessie Beatty and Rose Wilder Lane, journalists at the Chronicle. The young women moved to the cheap arty neighborhood of Telegraph Hill, and became the center of a talented crowd of writers and artists that included Elmer Hader. World War I changed their lives. Elmer was assigned to the Camouflage Corps in France, working with an artist friend to use their painting knowledge to hide army equipment from the enemy. Berta decided to go to New York City to see him off. Bessie Beatty had returned to New York after an assignment to Russia, writing on their government after the tsar. Her newspaper dispatches included embedding in a women only fighting unit—and later gained her a job as editor at McCall’s. She hired Berta to work on the fashion and children’s pages. As others came east for war assignments, the Telegraph Hill circle expanded to include Greenwich Village. Mary Margaret McBride, a newcomer from Missouri, wrote about how lonely she felt in New York. Once she joined Bessie’s group of the young and talented, she had friends, felt comfortable, and became an ardent fan of the Hader’s. Later they in turn provided fodder for her weekly radio broadcasts. Elmer and Berta married as soon as he returned from France. They searched desperately for a place with a view like San Francisco’s, and eventually found an old drafty summer hotel on the Hudson River. There was plenty of room for friends. These finished their workweek on Saturdays, hopped on the Erie railroad, and rode out to the Haders for the weekend. One friend would tell a newly met stranger that “I’m going out the Haders this weekend—want to come along? They’d love to have you.” Their circle grew rapidly. As new people were added, there were new ideas and stories to share, attracting more and more people. Of course everyone chipped in with food, housework, and yard work. Writer Katherine Ann Porter realized Berta was washing ALL the sheets by hand after they left, so organized a group to buy a washing machine. Berta quickly dubbed it “Abraham Lincoln because it freed the slaves.” These friends became invaluable as they helped Berta and Elmer build their fairy tale-like house on a hill high above the Hudson. The Haders were funny and charming and looked out for others. New people felt comfortable and kept returning whenever they were in the area. They accepted everyone, no matter their background. They kept other people’s secrets safe, so it was easy to confide in them. Berta was also a peacemaker, even when a communist, a Nazi, and a libertarian were at one dinner table! Their non-judgmental attitudes apparently encouraged active listening and deflected heated arguments. Maybe the variety of opinions meant no particular one prevailed. They blended into a small community. Most of their old and new friends kept in touch throughout their lives. They demonstrated how lives are enriched by the gifts friends bring: opportunities, ideas. Comfort, appreciation, and support no matter what. They clearly demonstrated that friends are the gift that keeps on giving. Thank all of you and Happy Friendship Day. Drawn Together--the Biography of Berta and Elmer Hader. 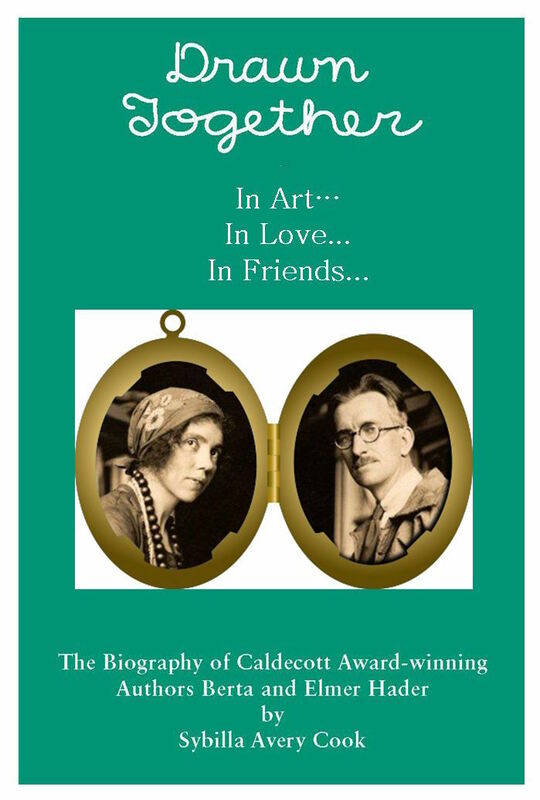 My latest book is a biography about Berta and Elmer Hader, Caldecott winning author/illustrators of the 20th century, entitled Drawn Together in Art, Love, and Friendships; The Biography of Caldecott Award-winning Authors Berta and Elmer Hader. Their work is represented in tall he major children book collections. Mary Margaret McBride, the Oprah of the 1930s, once said, “When I tell people about the Haders, they think they’re a figment of my imagination.” Their humor and creativity led to lifelong friendships with their editors and other luminaries: Imogen Cunningham, Bessie Beatty, Rose Wilder Lane, and Katherine Anne Porter. Their everyday lives exemplify the timeless themes of love, respect, hard work, passion for art and nature, and active conservation. Click on the Drawn Together tab for more about these wonderful people. They were happily married, were surrounded by talented friends who helped them build their own house on a hill, and visited them every weekend. They fought to save their neighborhood from demolition, and adapted to the myriad changes in publishing and in life. I wish I had known them both, but reading their letters to and from editors and friends was the next best thing. Actually, finishing the book left me feeling a bit adrift, but now that I am shifting into the promo mode, I am revisiting them once again. I hope you will feel that way, too. This book is published by Concordia University Publishing, 2016.